You don't come across many sludge bands named after obscure Dr. Seuss references. Acid Bath paradoxically cited the imaginative author in Dr. Seuss Is Dead, but I had no idea what "Noothgrush" really meant. Luckily my Seuss-obsessed wife wasted no time in announcing "There's a noothgrush on my toothbrush!" She was thrilled to know her expansive familiarity with the Seuss catalog contributed to this week's Sunday Sludge. 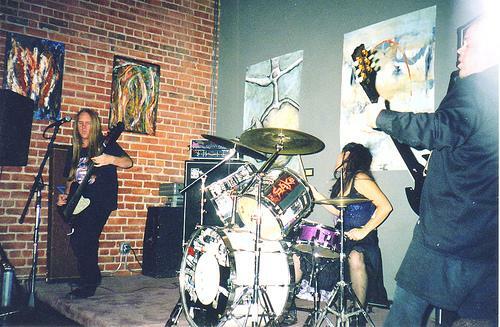 Noothgrush began infecting San Jose audiences with agonizingly bleak, crawling rhythms in 1994. Before parting ways in 2001, the band received far less attention than they deserved. Appearing on splits with the likes of Sloth, Corrupted, and Carol Ann, Noothgrush certainly held the pedigree and respect equivalent to other giants in the genre, though I'll make the argument they went greatly under-appreciated with releases like Kashyyyk (demo), and Embraced by the Anti-Self (EP). The retrospective Erode the Person, released in 1999, served as tutelage of a band that might win a race against snails and molasses and is certain to leave no inch of your skin feeling like it doesn't need a strong scrubbing. The music succeeds by stripping away all hooks and doing things on its own watch. Heavy, low, slow, and bleak as things can get, Noothgrush wear themselves out slugging away at dead trees and fractured lives. The hum arrives like an uninvited guest and the tempo sticks around in the corner, watching, as you and your friends start to whisper and get nervous. Let's just say Noothgrush's vision was never to make you feel comfortable. The vocals are pained, the lyrics are unsettling ("...tapped the vein once too often. Oil Removed. Human Failure..."), the pulse is patient and plodding. Play any Noothgrush track at a normal volume and the other side of town is gonna feel it. A thick rumble follows where this band treads, but the collateral damage left behind is the footprint they leave on your back as you struggle to find your way off the soggy ground. There's a reason Noothgrush's followers are so rabid. "The Power of the Riff" will feature Noothgrush on two nights in two cities (San Francisco's Elbo Room on 8/15, Neumo's in Seattle on 8/18) alongside Winter, Pelican, and MANY others. These dates mark the bands first live shows in a decade! For those of you who can't make the trek (like myself), a 20-track mixer is available for free download here. Also, look for Southern Lord to release Live for Nothing (live recordings), while late 2011 will see unreleased covers and lost tracks on Arcane Failures. After ten long years, Noothgrush is once again giving listeners a lot to be excited about.